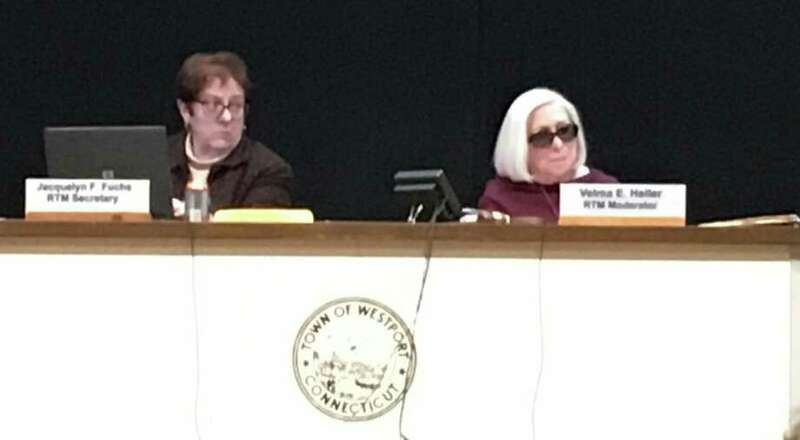 Westport Representative Town Meeting (RTM) Secretary Jacquelyn Fuchs and Moderator Velma Heller presided over the Feb. 6 RTM meeting in Town Hall. WESTPORT — The Representative Town Meeting didn’t make any large decisions at its Tuesday meeting, but it did approve three smaller motions aimed at bureaucratic efficiency and cross-town collaboration. The legislative body voted to approve money for new time and attendance software for town employees, to participate in a multi-town recycling program, and to nominate Deputy RTM Moderator Jeffrey Wieser to serve as the town’s alternate representative to the Western Connecticut Council of Governments (WestCOG) when First Selectman Jim Marpe cannot attend. “Each department was pretty much doing their own way of inputting information for payroll,” Personnel and Human Resources Director Ralph Chetcuti said, calling on the RTM to appropriate $40,000 from the Special Appropriations Account for the purchase of NOVAtime Web-Based Time and Attendance software and hardware. The RTM unanimously approved the appropriation for NOVAtime, which Chetcuti said will streamline payroll processes among all town departments and input payroll data automatically, as opposed to manually, thus saving town employees time. Additionally, the software will facilitate more accurate payroll reporting, which may save the town costs down the line if payroll data is needed for a federal audit of or lawsuit against a town department. Secondly, the RTM unanimously voted to approve the town’s participation in the Greater Bridgeport Recycling Interlocal Agreement. Recently retired Director of Public Works Stephen Edwards temporarily came out of retirement on behalf of the Public Works Department to explain to the RTM the multi-town recycling network. The interlocal recycling agreement, which includes towns in the greater Bridgeport area, first began in 1990 and is set to expire this year, Edwards said, adding the new agreement is simply an extension of the old agreement. Cross-town collaboration on recycling efforts allows Westport to eliminate the intermediary and negotiate, as part of the group, directly with the recycling contractor. Lastly, Marpe spoke in support of Wieser’s nomination as Westport’s alternate representative to WestCOG, the 18-town coalition that works to address inter-municipal issues, such as transportation, housing and economic vitality. All the RTM members except Wieser, who abstained, voted to approve his nomination. The RTM will next meet March 6 at 7:30 p.m. in the Westport Town Hall Auditorium.